Necklace as described in title. A fabulous combination. Necklace approx 55 cm. Supplied with a gift box. STAMPED 14ct KGR. 1/2" PENDENT. LOVELY DENTY PENDENT AND CHAIN. GENUINE HEATED ASIA PINK RED RUBY STERLING 925 SILVER NECKLACE 19"
This is a very beautiful new never been worn Handmade Genuine Heated Asia Pink Red Ruby ( Africa ) Sterling 925 silver with 14k white gold coating Necklace. NECKLACE 19". WITH 14K WHITE GOLD COATING ! Beautiful Sterling Silver Cardino chain with a quality small Ruby bezel set in sterling silver. Ruby gemstone tiny pendant Necklace. The Ruby is approx 6mm and moves freely along the chain. Both the Chain and bezel are Sterling Silver. Ruby and diamond set. Ruby oval faceted size 4mm X 2.8mm. Chain English made hayseed link with bolt ring clasp very strong. Ruby Zoisite contains both the properties of fiery Ruby and earthy Zoisite, a combination of passion and patience. Physically, it calms a racing heartbeat, relieves inflammation, and promotes strength in the immune system, heart, andlungs, fighting bacterial infections. Rubies 1.75ct Necklace. with 18Carat Yellow Gold Chain. Rubies: 1.75ct. (approx.). If a watch is still under a manufacturer warranty, but has less than twelve months remaining then we will top this up to twelve months. Sterling Silver and ruby red Chalcedony gemstone Dragonfly Necklace. The charms are connected into a hand cut chain, which is finished with a Spring Ring and End Ring. The chain used is a sturdy rolo / belcher chain. All top quality Sterling Silver materials are used. Ruby is the Birthstone for July, and this red Chalcedony is a very nice alternative gemstone. The standard chain length is 16 inches but if you prefer a shorter or longer length just send a message. Gold and Silver Jewellery. - Body Jewellery. - Titanium Jewellery. - Fashion Jewellery. - Jewellery Care. - Other Jewellery. - Wedding Jewellery. - Diamond Rings. Adjust by where you put the hook in the 2. in 2 chain leaving the ends to hang down the back ,could also be cut to size . EACH ABALONE IS SLIGHTLY DIFFERENT DUE TO NATURAL AND HAND POLISHED. Ending 23 Apr at 9:13PM BST3d 12hMetal: Silver PlatedStyle: ChainLength: 16 - 17.99"
Looks perfect.Worth every penny.original price lot more then asking price. £23.84/gram.ans all those diamonds. 9ct Gold Ruby Fob With Chain beautiful deep red stone ... Condition is Used. This in a lovely condition and is quite old and it has a 20” chain! Dispatched with Royal Mail 2nd Class signed for. Adjust by where you put the hook in the 2. in 2 chain leaving the ends to hang down the back ,could also be cut to size . EACH RUBY IS SLIGHTLY DIFFERENT DUE TO NATURAL AND HAND POLISHED STONES. Ending 24 Apr at 8:37AM BST4dCollection station availableMetal: Yellow Gold PlatedStyle: ChainLength: 16 - 17.99"
Beautiful mixed gemstone necklace. Main Stone Shape Oval. Main Stone Color red green blue yellow pink. Over 5 cts of Ruby oval nugget beads 5mm - 7mm on solid 14k yellow gold chain. Main Stone Ruby. Main Stone Shape Oval. Style Chain. A PAIR OF SILVER PEARL EARRINGS IS FREE WITH THIS NECKLACE EARRINGS. MAKING OF THIS NECKLACE IN VERY FINE AND IS MADE BY THE ARTISANS WHO ARE MAKING THE JEWELLERY OF DIAMOND. This is an authentic handmade necklace.You will receive a Necklace as shown in picture. Color:- Purplish Red. We will do our best resolve your issues. Duet Trillion-Cut Created Ruby Sterling Silver & 10kt Yellow Gold Pendant 18"
This sophisticated pendant has an eye-catching created ruby and well crafted silver beaded accents that are sure to make heads turn. This created ruby pendant that is crafted in sterling silver and 10kt yellow gold has a unique look any woman will be proud to wear. COMPLETE HANDMADE SILVER NECKLACE WITH EARRINGS STUDDED WITH FINE QUALITY OF REAL PRECIOUS GEMSTONE RUBY ( OVAL ) ATTACHED BEADS IN 22K GOLD POLISH. THIS NECKLACE SET IS ALSO AVAILABLE IN FULL BLUE SAPPHIRE. MAKING OF THIS NECKLACE IN VERY FINE AND IS MADE BY THE ARTISANS WHO ARE MAKING THE JEWELLERY OF DIAMOND. 10.8 Grams. Secondary Stone Ruby. Main Stone Ruby. This is an authentic handmade necklace.You will receive a Necklace as shown in picture. Shape:- Round. Color:- Purplish Red. Kindly don't falter to reach us for any reason. We will do our best resolve your issues. 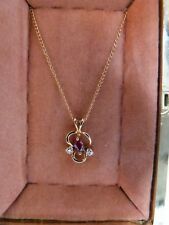 Vintage 9ct gold necklace with 8 diamonds + 1 ruby & 3 colourful natural gems! Beautiful hallmarked 9ct gold necklace and pendant. 8 diamonds 1 ruby 3 natural colourful gemstones! THIS GORGEOUS PENDANT IS A CIRCLE WREATH WITH 20 DIAMONDS AND 19 RUBIES CIRCLING A 5 CARAT RUBY CABOCHON. THE CHAIN IS 18" LONG AND FEATURES 6 ROUND RUBY BEADS OF 5.65MM. Main Stone RUBY CABOCHON. STONES: RUBY. WITH STONE ROC RUBY. Peso total en quilates (PTQ) 2. PRECIOUS CHAIN. Estilo Collar. Color de la piedra principal Rojo. Tratamiento de la piedra principal Irradiación. WITH HEART PENDANT. SEND WITH BAG. Turkish Handmade Jewelry Double Ring Multicolor Topaz 925 Sterling Silver Necklace. It is perfect example of "Turkish" handcraft production. Material is 925 sterling silver. The stones are Multicolor and TOPAZ. This product is highly polished gold created ruby celtic style necklace pow chain, elegantly crafted in high quality 9 ct yellow gold for a warm and classic tone. All possess beauty, rarity and durability.